A lot of new builds properties in Moraira await you at Spanish Property Sales so that you can fulfill the dreams you set for yourself. Many of our properties have been designed to meet the needs of our customers. One of the main preferences that we ask when you want to buy a house in Moraira is that it is located near the sea. The motto of our work is none other than to fulfill the objectives of our clients. For that same reason, we have properties near the Mediterranean coast. Thanks to the spectacular weather that Moraira enjoys, the owners can quickly get close to the sea and enjoy unforgettable days. So, if you are one of the people who has always dreamed of living near the sea, in our real estate agency you can fulfill your dream of always. But that is not all. There are many clients who love the sea, but who also love to bathe in fresh water. For them, our real estate agents offer the possibility of fulfilling both objectives at the same time: living in a home with a private pool, which is located near the sea. Why buy one of our new build properties in Moraira? 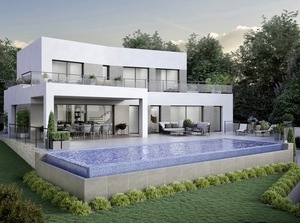 In addition to the previous reasons that we have explained why you should buy one of our new build properties in Moraira, there are other reasons. One of them is to benefit from incredible sea views. Can you imagine being able to get up or go to bed every morning, go out to your terrace your terrace and enjoy a beautiful landscape ? With our real estate agency you can do it every day. Another reason why you have to buy one of our homes is the leisure of Moraira. You will have quick access to restaurants, shopping centers, golf courses, etc. If before buying one of our incredible properties of new build in Moraria you want to access more information, you can visit our catalog of properties or you can contact us. Check your questions in person calling us by phone at (0034) 966 492 515 or send us an email to mail@spanish-property-sales.net. Whichever option you choose, you will be attended with total professionalism.